The shortfin mako is considered the fastest shark in the world, able to reach burst swimming speeds of up to 43 mph (70 km h-1) (Diez et al. 2015). This classically shaped shark is hydrodynamically efficient with a pointed snout, triangular dorsal fin and large and a crescent-shaped caudal (tail) fin. It is a dark metallic blue on top and silvery white below, with a very distinct color break down its side. The shortfin mako shark is a very active species, often seen breaching the water surface when feeding (Compagno et al. 2005). The shortfin mako is considered one of the great gamefishes of the world (Compagno et al. 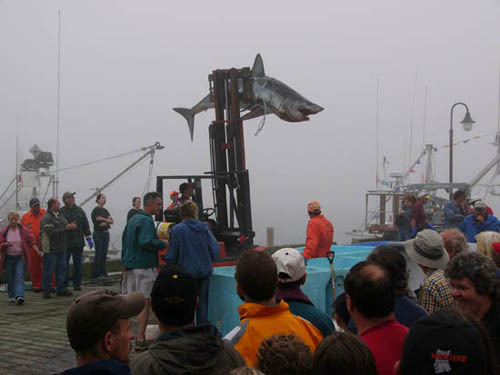 2005) and is listed as such by the International Game Fish Association (IGFA). Large sport angling for this species occurs in southern California, New Zealand, and South Africa. The shortfin mako is also a highly sought after commerciallly. The meat is consumed, the fins are used for shark-fin soup, and liver oil is extracted as a source of vitamin A (Cailliet et al. 2009). Although an oceanic species, the shortfin mako’s power and speed, make it potentially dangerous to humans. Shortfin makos been implicated in 10 unprovoked attacks on humans, one of which resulted in a fatality. Divers who have encountered shortfin makos note that they often swim in a figure eight pattern and approach with mouths open prior to an attack. Shortfin makos frequently damage boats and injure fishers after being hooked (ISAF 2018). The apparently insatiable demand for shark fin soup in SE Asia and the popularity of mako flesh in western markets has adversely imapacted population numbers. Worldwide, the shortfin mako is considered overharvested as a result of direct targetting and as by-catch associated with tuna and swordfish fisheries. 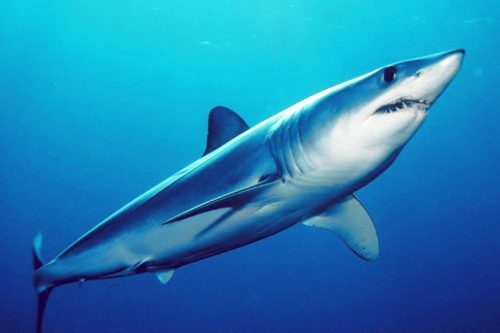 The U.S. National Marine Fisheries Service (NMFS) includes the shortfin mako on their list of managed pelagic sharks. This species is also listed under the 1995 UN Agreement on the Conservation and Management of Straddling Fish Stocks and Highly Migratory Fish Stocks (UNFSA), which requires that all fishing States implement measures to conserve the species. Unfortunately, a lack of scientific data, underreported catch data and the large scale nature of their movement patterns, has made it challenging to collect accurate information about the status of their populations globally. Genetic work has identified three distinct subpopulations of the shortfin mako These are assessed separately under the IUCN (Cailliet et al. 2009). 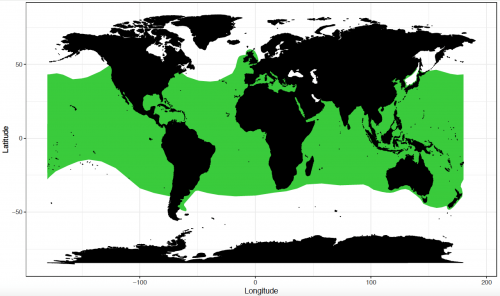 > Check the status of the shortfin mako at the IUCN website. The shortfin mako is found in tropical and temperate waters throughout the world’s oceans. In North America, it ranges from California to Chile in the Pacific and from the Grand Banks, Canada to Argentina in the Atlantic, including the Gulf of Mexico and the Caribbean Sea. In the eastern Atlantic, the shortfin mako ranges from Norway to South Africa, including the Mediterranean and it is found throughout the Indian Ocean from South Africa to Australia. In the western Pacific, it ranges from Japan to New Zealand and in the central Pacific it occurs from the Aleutian Islands to the Society Islands (Calliet et al. 2009, Compagno et al. 2005). The shortfin mako is a true pelagic species with a worldwide distribution. They are primarily resident in oceanic waters but can also be found near the coast where the continental shelf is short. They occur from the surface to about 500 m (1640 ft) and usually inhabit waters that are above 16°C (60°F) (Calliet et al. 2009, Compagno et al. 2005). The shortfin mako body is conic-cylindrical and markedly hydrodynamic. The snout is bluntly pointed with large black eyes. The caudal keel is prominent and the caudal fin lunate. The tail has a high aspect ratio (ratio of height to length), which produces maximum thrust with minimum drag and provides almost all of the propulsion for the shark. The mouth is distinctly U-shaped (Compagno et al. 2005). 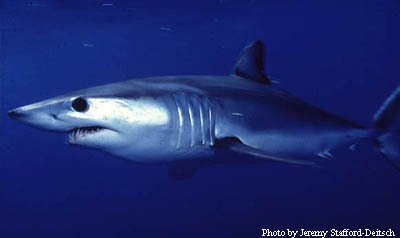 There are two extant (living) mako sharks, the longfin mako (Isurus paucus) and the shortfin mako (Isurus oxyrinchus). The longfin mako resembles the shortfin mako, but has larger pectoral fins and larger eyes. The presence of only one lateral keel on the tail and the lack of lateral cusps on the teeth distinguish the makos from the closely related porbeagle sharks of the genus Lamna (Compagno et al. 2005). Color is a deep metallic blue dorsally and white ventrally. The line of dtransition between blue and white on the body is distinct. The underside of the snout and the area around the mouth are white. The latter is important because is helps differentiate the shortfin from the longfin mako, which has a darkly pigmented region around the mouth. Color is related to size of the body. Larger specimens are darker and the dark pigmentation often extends onto parts of the body that are typically white in smaller individuals. The juvenile mako has a distinctive black blotch on the tip of its snout (Compagno et al. 2005). The profile of the mouth forms a parabolic U-shape, with the first teeth of the lower jaw aligned in a continuous row. The large, narrow triangular, teeth are hook-like and have razor-sharp smooth edges without basal cusps or serrations. Teeth of both the upper and lower jaw are similarly sized but the upper jaw teeth tend to be somewhat broader than the lower jaw teeth. The first two teeth on either side of the mandibular symphyses are longer and more slender than the rest. Teeth of the lower jaw are visible even when the jaw is closed, while the upper teeth remain partially hidden except when the upper jaw is projected outwards as it is when biting. Denticles are small and overlapping, with 3 to 5 ridges, and 3 marginal teeth. The middle marginal tooth is the longest and appears more worn down in comparison. It has been shown that the small fin mako can adjust the orientation of its denticles to regulate induced drag which likely helps the animal manoever at high speed. Average adult size is about 200-215 cm (6.5-7 ft) for males and 275-290 cm (9-9.5 ft) for females. Maximum size of a shortfin mako is about 400 cm (13 ft) in total length. Size at birth is 60-70 cms total length. Age at maturity is between 7 and 9 years for males and 18 to 21 years for females (Cailliet et al. 2009). Shortfin makos are estimated to live 29-32 years (Bishop et al. 2006). The shortfin mako is the fastest recorded shark, capable of leaping gret distances out of the water. 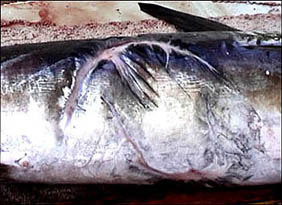 They feed on other fast-moving pelagic fishes such as swordfish, tuna, and other sharks, as well as squid. Marine mammals and sea turtles are occasionally ingested by this species (Cailliet et al. 2009). 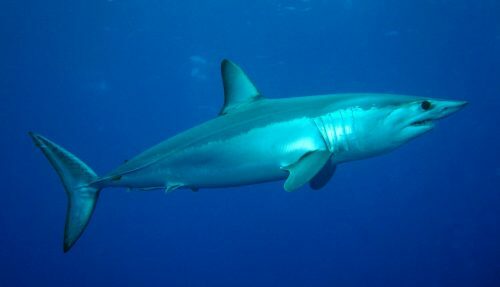 Shortfin makos are slow growing with males reaching maturity at 7-9 years of age and females not before 18 years of age. This, along with a three-year reproductive cycle, renders makos vulnerable to overfishing. Development is ovoviviparous. Embryos in the uterus are nourished by yolk stored in a yolk sac. There is no placental connection between mother and young. Once the young hatch in the uterus, they feed by oophagy. Oophagy is the ingestion of unfertilized or less developed eggs by a fetus that is more developed. Young are born after a 15-18 month gestation period. Litters range from 4-25 pups measuring 60-70 cm (23-28 in) in length (Cailliet et al. 2009, Mollet et al. 2002). Larger sharks may feed upon juvenile shortfin makos. Adult makos likely fall prey only to humans. Shortfin makos host a variety of parasitic copepods and flatworms. These are found on the skin, in the mouth, in the gills, internally and on the fins. 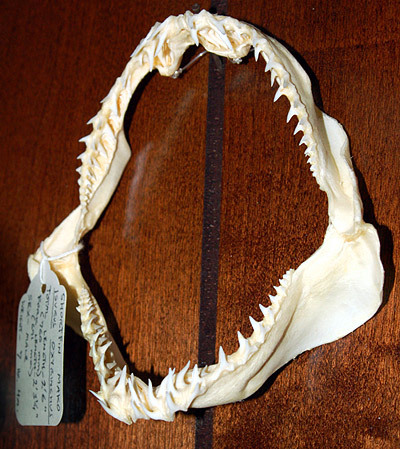 Species recorded from the shortfin mako include Dinemoura latifolia, Nemesis lamna, Gymnorhynchus isuri, Dimenchelys parasiticus, and Conchoderma virgatum (Benz 1980 and 1984, Caira et al. 1997, Caira and Bardos 1996, Williams 1978). Rafinesque first described this shark as Isurus oxyrinchus in 1810. Since then, it has also appeared in the literature as Isurus spallanzani Rafinesque 1810, Oxyrhina glauca Müller & Henle 1839, Isuropsis dekayi Gill 1862, Isurus makoWhitley 1929, and Isurus africanus Smith 1957 as well as many others. The species name oxyrinchus is translated from Greek “oxy” = sharp and “rynchus” = nose. Isurus is Greek for equal tail referring to its lunate caudal fin. Benz, G. W. (1980). Tissue proliferations associated with Nemesis lamna Risso, 1826 (Copepoda: Eudactylinidae) infestations on the gill filaments of shortfin makos (Isurus oxyrinchus Rafinesque). Journal of Fish Diseases, 3(5), 443-446. Benz, G. W. (1984). Association of the pedunculate barnacle, Conchoderma virgatum (Spengler, 1790), with pandarid copepods (Siphonostomatoida: Pandaridae). Canadian journal of zoology, 62(4), 741-742. Bishop, S.D.H., Francis, M.P., Duffy, C. and Montgomery, J.C. 2006. Age, growth, maturity, longevity and natural mortality of the shortfin mako shark (Isurus oxyrinchus) in New Zealand waters. Marine and Freshwater Research 57: 143-154. Cailliet, G.M., Cavanagh, R.D., Kulka, D.W., Stevens, J.D., Soldo, A., Clo, S., Macias, D., Baum, J., Kohin, S., Duarte, A., Holtzhausen, J.A., Acuña, E., Amorim, A. & Domingo, A. 2009. Isurus oxyrinchus. The IUCN Red List of Threatened Species 2009: e.T39341A10207466. Caira, J. N., & Bardos, T. (1996). 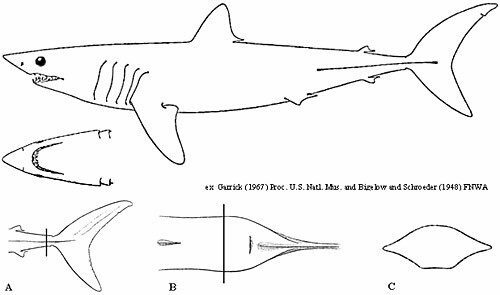 Further information on Gymnorhynchus isuri (Trypanorhyncha: Gymnorhynchidae) from the shortfin mako shark. JOURNAL-HELMINTHOLOGICAL SOCIETY WASHINGTON, 63, 188-192. Caira, J. N., Benz, G. W., Borucinska, J., & Kohler, N. E. (1997). Pugnose eels, Simenchelys parasiticus (Synaphobranchidae) from the heart of a shortfin mako, Isurus oxyrinchus (Lamnidae). Environmental Biology of Fishes, 49(1), 139-144. G. Diez, M. Soto, J. M. Blanco. (2015). J. Fish Biol. 87, 123. Mollet, H.F. and Cailliet, G.M. 2002. Comparative population demography of elasmobranchs using life history tables, Leslie matrices and stage-based matrix models. Marine and Freshwater Research 53(8): 503-516. Williams, E. H. (1978). Conchoderma virgatum (Spengler)(Cirripedia Thoracica) in association with Dinemoura latifolia (Steenstrup & Lutken)(Copepoda, Caligidea), a parasite of the shortfin mako, Isurus oxyrhynchus Rafinesque (Pisces, Chondrichthyes). Crustaceana, 34(1), 109-110.